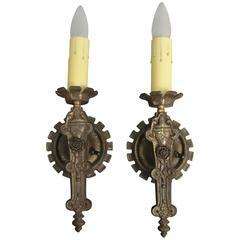 Pair of 20th century bronze signed single sconces made by renown New York metal craftsman Oscar Bach whose work is found at the Metropolitan Museum of Art. 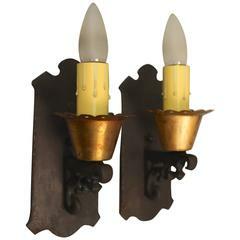 Classic antique pair of 1930s sconces would fit nicely in English Tudor, Spanish Revival and storybook homes. 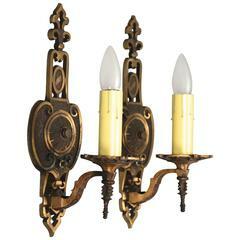 Measures: 9.5" H x 4" W x 4.25" D.
A set of 12 circa 1920s gilt bronze sconces. $3950 list pair, six pairs available. A pair of circa 1920 gilt bronze three-lights sconces. Simple brass sconces with a bronze finish, circa 1920. Priced per pair. Several pairs available at time of posting. These can be seen at our 400 Gilligan St location in Scranton, PA.